CRG will hold four games at Schmidt on the following dates: March 23 – Fan Appreciation Night – Black Sheep & Violent Lambs vs. Brandywine Roller Derby (Downingtown, PA) April 6 – Superhero Night – Black Sheep & Violent Lambs vs. Steel City Roller Derby (Pittsburgh, PA) April 27 – Star Wars Night – Black Sheep & Violent Lambs vs. Charm City Roller Girls (Baltimore, MD) May 11 – Pride Night – Black Sheep vs. Oklahoma Victory Dolls & Violent Lambs vs. 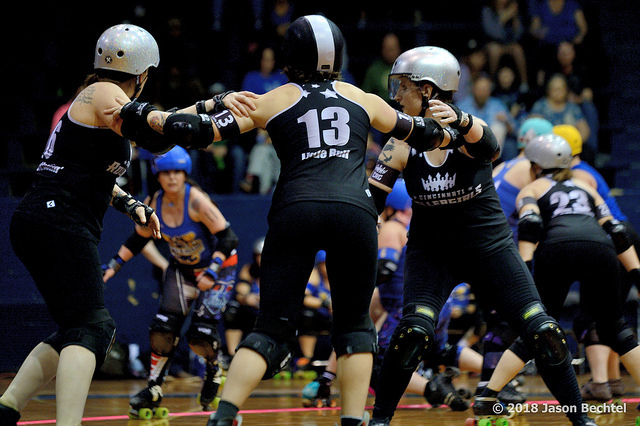 Burning River Roller Derby (Cleveland, OH) Season tickets and single game tickets are on sale now through Brown Paper Tickets. Located at 3900 Winding Way on Xavier’s West Campus, Schmidt Memorial Fieldhouse is primarily used by the university’s recreational sports program, but it has opened its doors for CRG games every spring since 2017. CRG drew an average of 1,000 fans to each of its home games in 2018 and finished the season ranked 77th out of 358 teams worldwide. Schmidt served as the home of Xavier’s basketball from 1928 to 1983 and has hosted a range of other events, from political speeches to professional wrestling. Before moving to Schmidt, the Cincinnati Rollergirls called the historic Cincinnati Gardens home from 2007 through 2016. The Gardens has been demolished by the Port of Greater Cincinnati Development Authority to make way for a high-tech manufacturing site. CRG is actively seeking sponsors for the 2019 season. For more information, visit our Sponsorship page, email our Sponsorship Manager or call 513-818-3372.